Laughter filled the Betts Theater as grand musical numbers and choreographed dance scenes filled the stage for the George Washington Department of Theater and Dance’s “Urinetown: The Musical” last weekend. The story follows Bobby Strong, a young man who works at one of the many public bathrooms. Due to a terrible water shortage for years, people have had to pay every time they want to go to the restroom. 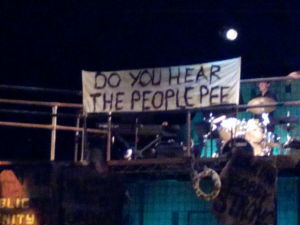 If they don’t comply, they are sent off to the mysterious Urinetown. The operation is overseen by the Urine-Good-Company run by Cladwell B. Cladwell, who has corrupted the politicians of the town and lives a luxurious lifestyle. Officer Lockstock and Little Sally, the narrators of the show, provide comedic relief with occasional commentary. One of the most memorable parts of the show was when Little Sally starts describing how awful the play’s title is and Officer Lockstock quickly tries to change the subject. Interesting character development in absurd situations proved to be a comedic staple throughout the performance. “It’s such a high energy show, it’s so much fun to be in,” said actress Marcelene Sutter. 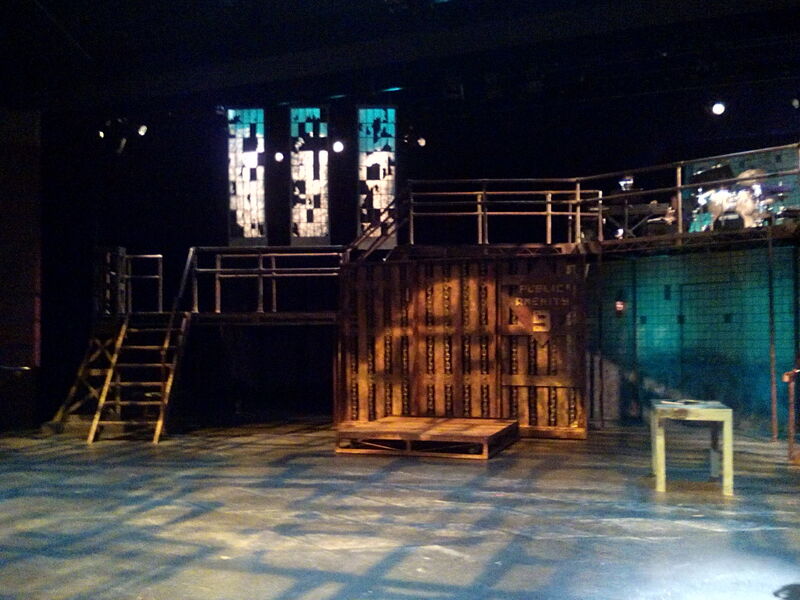 The set was eye catching and was designed by Master of Fine Arts candidate Kirk Kristlibas. 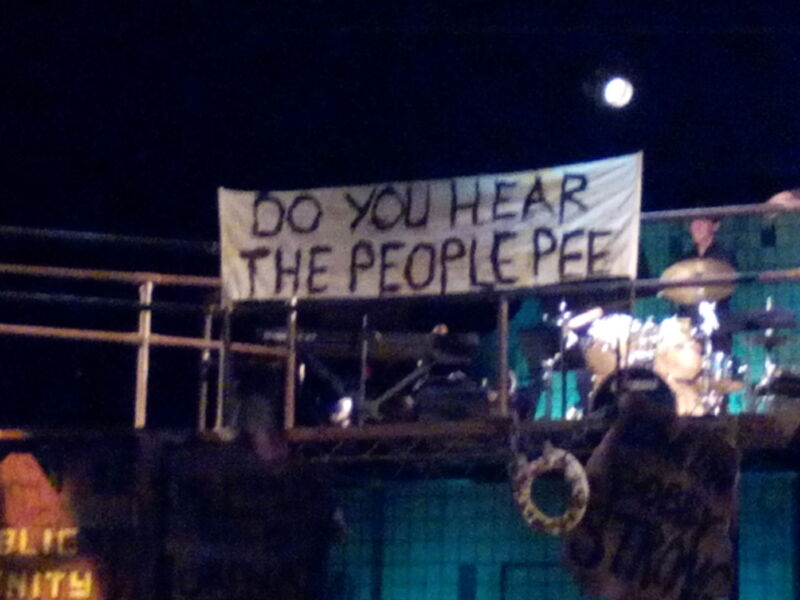 His set offered an unfortunately grotesque view into the world of Urinetown. With multiple levels and carefully designed piping, the set was a huge asset to the show. “The set is the most amazing thing I have ever seen,” said Sutter. 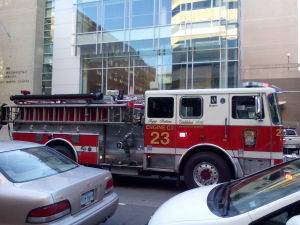 everyone remained in high spirits and took a commemorative photo in front of the fire truck singing one of the main songs. According to both a university staff member and university police officer, the small fire was caused by a cigarette. Urinetown: The Musical, is a truly fun time with a salient message about resource overuse, adroitly delivered through humor. Upcoming performances by the GW Theater and Dance Department can be found on their website, http://theatredance.columbian.gwu.edu/trda-2014-2015-mainstage-season. This entry was posted in Campus, Columbian College of Arts and Sciences and tagged acting, Betts, Department of Theatre and Dance, Marvin Center, musical, theater, TRDA. Bookmark the permalink.